- We at S.S.SON CONTROLS ( Mumbai ) are leading manufacturer suppliers of PT-1000 Thin Filament Sensor . - All of elements are provided after inspected the actual resistance value at 0 . That is a great advantage for making a pair of temperature sensors that need similar or the same resistance value. 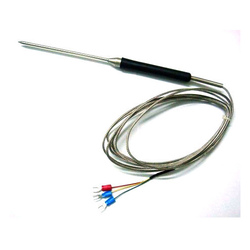 Our company has created a niche in the field of offering PT1000 Temperature Sensor. We are a leading manufacturer, supplier and exporter of testing and measuring instruments. In addition to offering superior products, we are also into the domain of providing effective value added services. The PT 1000 Sensor offered by us is used for the accurate measurement of temperature in the industrial sector. The Data Builder (TDB) allows you to develop your own control strategies to exactly match your application. Easy to understand and quick to customise, The Data Builder can be used as a stand alone Windows application or by direct connection to a Data Builder enabled Intuitive Controller.